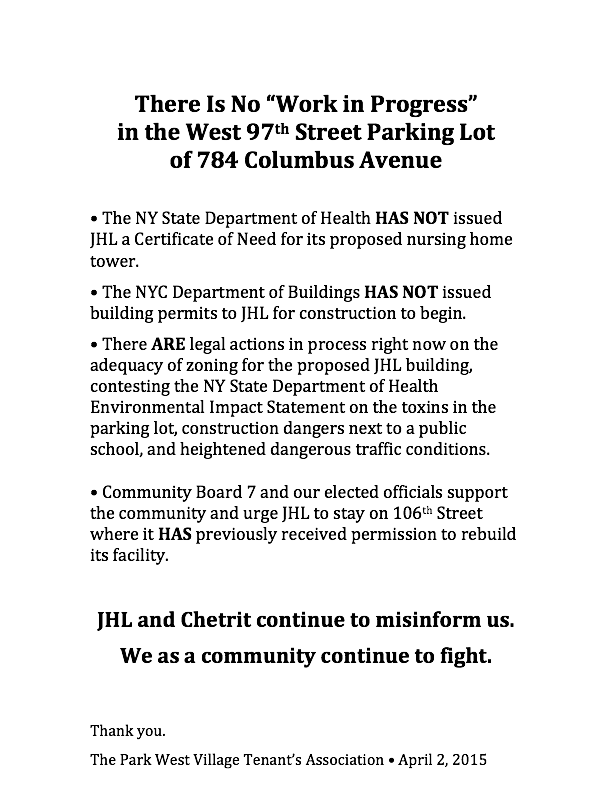 ﻿No JHL At PWV!﻿﻿ is a coalition of Park West Village community stakeholders, nursing home advocates, parents, tenants' associations, neighbors, renters, and condo owners who oppose Jewish Home Lifecare's (The New Jewish Home) inappropriate proposed development on West 97th Street. 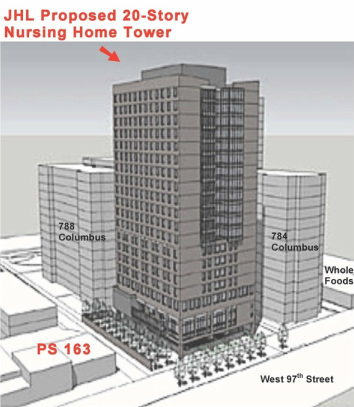 On October 16, 2018, the Appellate Division, First Department in Manhattan handed down a significant ruling in favor of a group of Park West residents who had filed a zoning challenge against Jewish Home Lifecare’s (JHL) proposed plan to build a 20-story nursing tower on the West 97th Street parking lot of Park West Village. The original challenge was filed with the New York City Department of Buildings (DOB) by 15 members of the Working Group, a group of neighbors opposed to the construction of the proposed nursing home. The claim was that under the New York City Zoning Resolution there was not sufficient open space on the zoning lot to construct a 20-story building. The Working Group contended that the two rooftop gardens located at 808 Columbus Avenue were improperly counted as open space because they were neither open nor accessible to the residents of three Park West Village buildings – 784 Columbus Avenue, 788 Columbus Avenue, and 792 Columbus Avenue – in violation of the Zoning Resolution requirement that open space must be open and accessible to all residents on the zoning lot. The DOB denied this challenge, and the Working Group appealed the decision to the New York City Board of Standards and Appeals (BSA). That agency also denied the challenge by relying on its 2009 decision involving 808 Columbus Avenue, where it ruled that the inaccessible rooftop gardens could be counted as open space if each building on the zoning lot received its own share of open space – a separate but equal theory that was created by the lawyers for 808 Columbus Avenue and had no foundation in any prior BSA decisions. This theory relied on the word “building” in various sections of the Zoning Resolution, but the Working Group pointed out that in 2011 the City Planning Commission had replaced the word “building” with the word “zoning lot” in five places in the Zoning Resolution, thus vitiating the theory that the total open space in the zoning lot could be allocated among the individual buildings within the zoning lot. The Working Group appealed the BSA decision to the Supreme Court, New York County, but that Court also rejected the challenge saying that the language in the Zoning Resolution was ambiguous. That decision was appealed to the Appellate Division, First Department, and on October 16, 2018, that Court reversed the lower court and rejected the theories put forth by both the BSA and the Buildings Department that open space could be allocated among the buildings. The Court ruled that under the “clear and unambiguous” language of the Zoning Resolution, open space must be open and accessible to all residents of the zoning lot, thus disqualifying the inaccessible 808 rooftop gardens (42,000 square feet) from being counted as open space and ordering that the building permit for the proposed tower be revoked. It is anticipated that the City (BSA) and the nursing home will seek permission to appeal this decision to the Court of Appeals. The Working Group was represented at the Appellate Division by John Low-Beer, Esq. The Working Group was represented at the BSA and in the lower court by Dean J.M. Heitner, Esq., the Chair of the Working Group, and by Hillel Hoffman, Esq. Brian Cook in Comptroller Stringer’s Office provided invaluable information about the change in the Zoning Resolution. The Working Group thanks all our local elected officials who filed letters of support with the Court and the BSA. JHL’s proposed 20-story New Jewish Home on the West 97th Street parking lot of Park West Village presents significant concerns for the quality of life and safety of the frail, elderly people who would reside there. As for quality of life, JHL’s plan would place their frailest, long-stay residents on top floors, while allocating rooms on lower floors for people requiring short-stay rehabilitation services. This would have the effect of severing street-level connections for resident likely to spend the rest of their lives in the high-rise tower, while allowingthose who would stay for only a month or two to with easy access to the normalcy of street-level life. One of the justifications that JHL has given for its proposed 20-story tower on the West 97th Street Parking lot of Park West Village is that it would be the first example of the Green House (GH) model in an urban environment. There are two major problems, among others, with the proposal. In an op-ed piece in the New York Times (October 3, 2018), Philip Landrigan, the director of the Global Public Health Initiative at Boston College, and Lynn R. Goldman, the dean of the Milken Institute School of Public Health at George Washington University, warn of the dangers to children’s health by the decision of the federal Environmental Protection Agency (EPA) to place the director of the Office of Children’s Health Protection on “administrative leave” – a signal that the EPA may close the Office of Children’s Health Protection. A group of Park West residents recently had three meetings with Governor Andrew Cuomo’s staff to express strong objections to Jewish Home Lifecare’s (JHL) proposed 20-story nursing tower directly next to the P.S. 163 elementary school on West 97th Street. Soil in the proposed site has been tested and is proven to contain dangerous levels of lead and other toxins. Deafening noise, toxic dust, and traffic congestion from proposed construction (projected to take 3+ years) would create major health problems for school children and the community. De Blasio opposes bill limiting construction noise near schools, siding with proposed building project (The New Jewish Home) backed by one of his donors. Environmental Case May Include Arguments on Controversial Amicus Brief. On December 9, 2015, Justice Joan B. Lobis of the New York State Supreme Court ruled that the New York State Department of Health, in its Final Environmental Impact Statement in the State Environmental Quality Review process (SEQRA), failed to take a “hard look” at specific environmental issues raised by experts and the community about the severe impact of JHL’s proposed development. In her ruling, Judge Lobis “vacated and annulled” the DOH determination that previously approved JHL’s application, and ordered that the matter be sent back to DOH for reconsideration of findings on issues of noise and hazardous materials. Petitioners of the two related Article 78 proceedings against DOH included tenants from buildings surrounding the proposed West 97th Street site and parents of young children at PS 163, the elementary school adjacent to it. State Supreme Court orders nursing home project to reexamine the impact of construction on surrounding community. "The state Supreme Court ruled that the state Department of Health failed to adequately review the potential impact of noise and hazardous materials from the construction of Jewish Home Lifecare's proposed 20-story nursing home and must redo those aspects of its environmental review." "The financing for JHL’s project also adds another dimension of hope to opponents of the plan. Mega-developer Joseph Chetrit, who owns Park West Village, is providing $35 million in financing for the nursing home project and transferring ownership of the lot to JHL in exchange for a JHL property at 120 West 106th Street, at which the developer plans to build luxury housing. But Chetrit was recently named in a lawsuit brought by the city of Almaty in Kazakhstan and BTA Bank, the third largest bank in that country. The suit alleges Chetrit helped two foreign businessmen hide $40 million in stolen assets belonging to Almaty and the bank through real estate deals in New York. Although the case was settled out of court, Chetrit is accused in the lawsuit of having violated various U.S. laws." The proposal by Jewish Home Lifecare (JHL) to build on West 97th Street remains stalled for many reasons. - Petition to NY State Homes and Community Renewal (HCR) to preserve all outdoor parking spaces. ﻿ - An ﻿Article 78*﻿﻿ filed in the NY State Supreme Court challenging the NY State Department of Health (DOH) approval of the Environmental Impact Statement that the DOH was forced to undertake. - A second Article 78* by the parents of PS 163 focusing on the deleterious effects of proposed construction on the children attending that elementary school. - A challenge to the NYC Board of Standards and Appeals (BSA), which challenges their approval by the NYC Department of Buildings (DOB) of the zoning plan for JHL, which we contend violates open space requirements in the NYC Zoning Resolution. While the HRC litigation did not succeed in preserving existing parking lots, the true success for the Park West Village Tenants' Association was the retention of above ground spaces for rent-stabilized tenants. This also allowed other actions to be developed and filed. The Article 78s against the DOH await the judge’s decision, and the Court challenge to the BSA decision is in its early stages. Second, JHL must still comply with remaining contingencies in their Certificate of Need (CON) from the DOH. And third, several damaging disclosures have recently appeared in the media – one reported a lawsuit in which Joseph Chetrit, developer and landlord of 784, 788 and 792 Columbus Avenue, was accused of illegally laundering large sums of stolen foreign money. Another revealed campaign contributions to Mayor de Blasio, Governor Cuomo and Dean Skelos from consultants with ties to nursing homes and real estate developers. It is unclear what effect any of these disclosures may have on the ability of JHL to go forward – financially or otherwise. If you are interested in more details, please read the attached summary, JHL: Rebuild on 106th Street, from a PWV neighbor who’s active in our cause. Please Click Here. Nine residents of the Park West Village neighborhood on the Upper West Side of Manhattan have filed a lawsuit against the New York State Health Department to prevent it from giving approval to Jewish Home Lifecare (JHL) to construct a twenty-story nursing home on a parking lot on West 97th Street. The lawsuit challenges the Department’s handling of a State Environmental Quality Review (SEQR) proceeding, which was initiated after significant amounts of lead and other toxins were found at the proposed site. The parents and children at P.S. 163 on W. 97th St. in Manhattan filed suit on Wednesday, March 25, 2015, in New York County State Supreme Court, challenging the NY State Department of Health's irresponsible approval of a dangerous construction project to be built directly next to the school. Please note the public hearing will be on two nights -- please mark your calendars for both nights. The Department of Health will send out an official public notice of the hearing and post the DEIS (click here, see line #7) at least 30 days prior to the hearings. They have not yet done so. More information will be distributed as we have it. 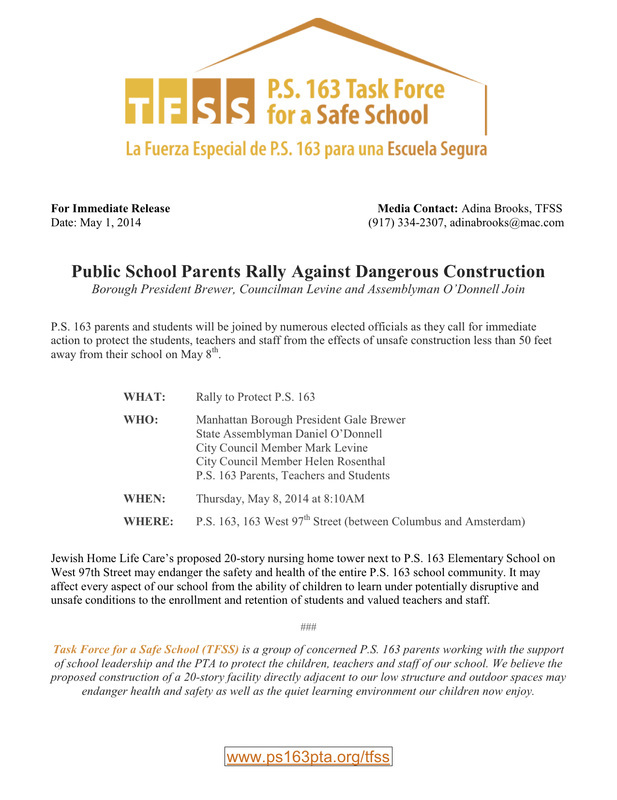 ﻿﻿﻿SCHOOL RALLY TO PROTECT PS 163 - Please Join! We have been told that The PS 163 Task Force For a Safe School (TFSS) recently met with representatives of Jewish Home Lifecare. JHL presented an overview of their plans for construction and for how they would mitigate the impact of construction. To date, the TFSS is not convinced this is possible. The meeting concluded with the mutual understanding that the conversation cannot continue until JHL provides specific information to the TFSS. As of this writing, JHL has not produced the requested details. At the request of JHL, also present were representatives from Greenberg Traurig LLP (as JHL’s legal council), AKRF Inc. (as the consultants preparing the Environmental Impact Statement on behalf of JHL), The Dormitory Authority of New York State (as technical advisers to the New York State Department of Health on environmental reviews), Sam Schwartz Engineering (as the consultants providing traffic study for JHL), Tishman Construction, The Department of Education, The School Construction Authority, United Federation of Teachers, and Councilmember Mark Levine’s office. On January 31, Assembly Member O'Donnell requested that due to the recent traffic-related tragedies in our immediate area, Mayor de Blasio place a construction moratorium on West 97th Street and environs. 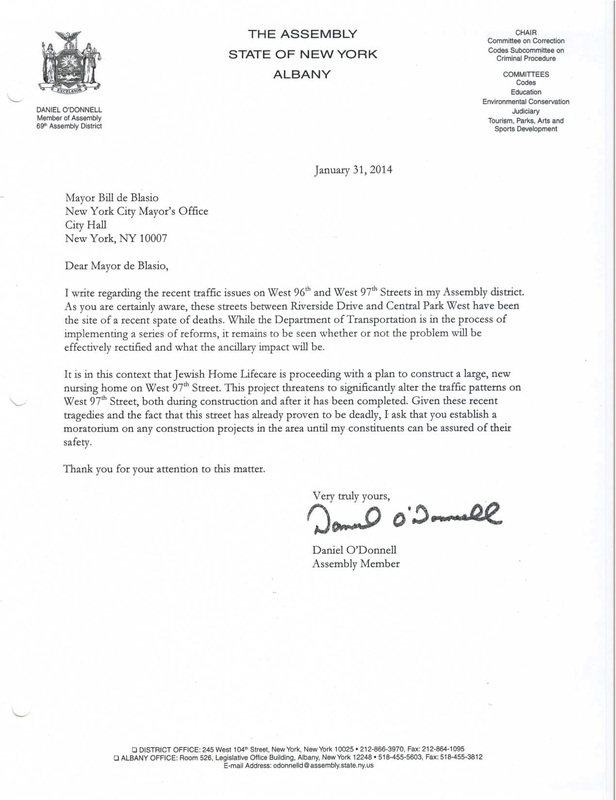 In the letter below, Assembly Member O'Donnell specifically names Jewish Home Lifecare's proposed plans to construct a 20-story nursing home next to PS 163. We thank our Assembly Member for his stance, and for working to assure the safety of all who live, work, and attend school in our community. PS 163 Task Force for a Safe School is a group of concerned PS 163 parents advocating to protect students and staff in response to the proposed construction. Created by the PS 163 PTA, it has recently launched its website, facebook page and twitter account. Please follow all for current school involvement and updates. DNAinfo: What is your position regarding the development of a new Jewish Home Lifecare nursing home on West 97th Street? And if you oppose it, how do you plan to help halt the development? ﻿Mark Levine:﻿ I’m against it. This project will have a dramatic environmental impact. The construction process will have an impact on air quality, noise and safety. Traffic will be a concern. The strain on mass transit. Loss of light, air, green space. We have to hold JHL accountable. The community has succeeded in forcing JHL to do an environmental impact statement. We need to understand the environmental impact. I am particularly concerned that this development site will stand in front of an elementary school... Can you imagine being a third-grader having jackhammers outside your window? The families of the students need to be heard. UPDATE﻿﻿﻿ ONCE AGAIN the community mobilized and produced great results! There will be a public hearing on the Draft Environmental Impact Statement regarding Jewish Home Lifecare's proposed facility on 97th Street between Columbus and Amsterdam Avenues. You, along with our local electeds, were successful in securing a public hearing as part of the next public comment period. (Please see below for text from 12/10/13 letter from NYSDOH). We will continue to update this site with any information regarding the release of the DEIS as well as any information regarding the public comment period that will follow. Thank you for your recent e-mail to Charles P. Abel, Director, Division of Health Facility Planning, urging the New York State Department of Health (Department) to conduct a public hearing on the pending Draft Environmental Impact Statement for Jewish Home Lifecare's proposed construction of a nursing care facility, located on West 97th Street in Manhattan (Certificate of Need application #121075). The Department is currently processing a voluminous amount of public comments received on the Draft Scoping Document submitted at the Scoping Session held on September 17, 2013 at P.S. 163 as well as written submissions by mail and e-mail. A final Scoping Document, incorporating relevant comments and revisions, will provide the framework for the preparation of the Draft Environmental Impact Statement (DEIS). Once the Department deems the draft DEIS as complete, it will issue the draft DEIS for public review and wiil notice and schedule a public hearing on the draft DEIS in accordance with l0 NYCRR 97.9(d). Let me assure you that the Department is thoughtfully considering the concerns raised by the community, and it is our goal to ensure the safety and health of the residents of the neighborhood. Thank you for sharing your concerns. If you have additional questions or need further assistance, please contact Mr. Henry Joseph of the CON Review Group at (518) 402-0964. The public comment period has closed. Please check back for further developments and the New York State Department of Health's response to submitted comments. 9/17/13 Public Scoping Meeting at PS 163 was inspiring. The four-hour, standing-room-only hearing brought the community out in full force to voice concerns on the environmental impacts of JHL’s proposed 20-story development on West 97th Street. The next crucial step is for each of us to submit comments on how the proposed project would affect our health and well-being. We must flood the NYS Department of Health, exercise our right to the mandated comment period and get our concerns on the record. The sooner the better. Here’s how to submit yours. Noise – construction, building compressors, traffic, etc. Air quality and pollution – excavation, construction, vehicles, etc. Comments must be received by Friday, Oct 4, 2013 by mail, email or fax. DATE SET FOR PUBLIC SCOPING MEETING! A big turnout at this meeting is critical. Your signature counted, and so will your presence. Please plan to attend! The New York State Department of Health (NYSDOH) has determined that the plan by Jewish Home Lifecare (JHL) to build a 20-story nursing home on West 97th Street may have a significant effect on the environment. Because of the community's sustained activism, and with the help of various elected officials, JHL has been compelled to submit a study that will look at a list of 23 potential environmental impacts on PS 163 and the surrounding neighborhood both during and after construction, e.g., lead or other contaminants in the soil, traffic, noise, shadows, quality of life, safety, etc. A State Environmental Quality Review (SEQR) of JHL's proposed development is underway and one of the first steps is a public scoping meeting to present the Draft Scoping Document. The purpose of the NYSDOH meeting is for the community to learn about and then comment on the scope of the environmental impact review that JHL must complete before potential construction can begin. At the meeting, the community will have the opportunity to voice concerns regarding every aspect of the environmental impact on the neighborhood. You will help shape the depth of the environmental investigation (the Draft Scoping Document). Please come prepared with your specific concerns. Written comments may be sent and will be accepted for a period of ten calendar days following the close of the Public Scoping Meeting. “A public scoping meeting must be held to solicit comments on the draft scope from all affected and interested parties. Comments at these meetings must be limited to the scope of work for the EIS and any changes needed to ensure appropriate and thorough assessment of potential impacts. The meeting must be scheduled 30 to 45 days after notice is given and the draft scope and EAS are circulated to all affected and interested agencies, community boards, groups and officials. Written comments may be received within ten days after the public meeting. June 5, 2013 NYSDOH determines the JHL proposed project may have a significant impact on the environment. NYSDOH issues EAS Positive Declaration. May 23, 2013 JHL submits to NYSDOH Environmental Assessment Form ("EAS Part I and I") which formally starts the SEQR process. 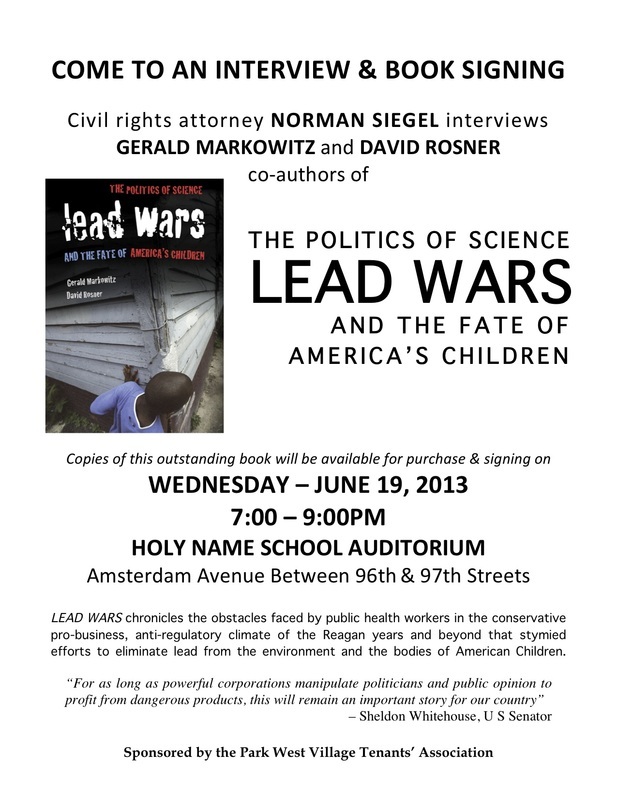 Bill Moyers talks with David Rosner and Gerald Markowitz about their new book, Lead Wars: The Politics of Science and the Fate of America's Children, in which they state there is no safe level of exposure to this dangerous toxin. UPDATE WE ARE STARTING TO GET TRACTION! Thank you for your signatures. Please continue to email, post, tweet and promote our cause. May 16, 2013: Online petition reaches 1,300 signatures. May 3, 2013: Mark Landis, Democratic Party district leader and City Council Candidate, writes in an email to his constituents: "The lead levels found in the soil are frightening, and especially dangerous to young children and seniors. Clearly, no development should be permitted to occur on this site until a full environmental impact assessment has been performed. "I've joined with Congressman Jerry Nadler, Manhattan Borough President Scott Stringer, Council Member Melissa Mark-Viverito, the United Federation of Teachers, P.S.163 parents, Community Free Democrats and hundreds of other Upper West Siders in demanding that Governor Andrew Cuomo require the State Health Department and the State Department of Environmental Conservation to perform an environmental impact assessment as required by the State Environmental Quality Review regulations (SEQR)." We appreciate their support, and we appreciate yours! 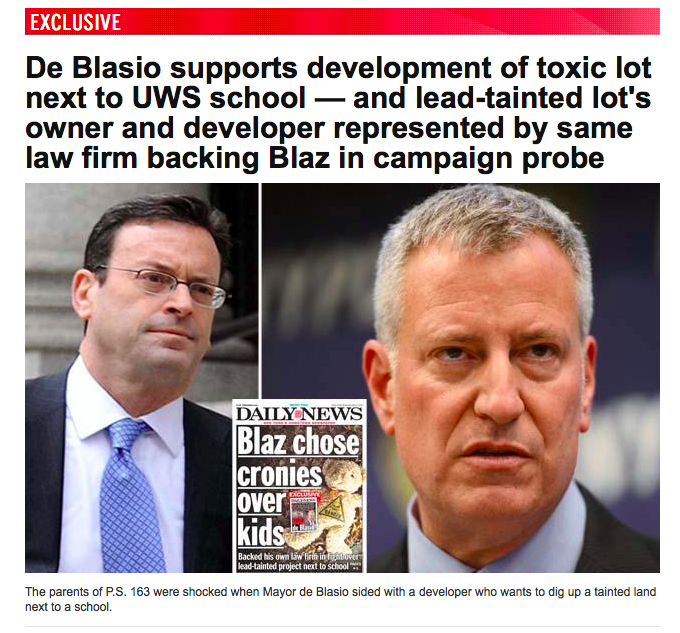 On April 24, 2013, at The Holy Name School on West 97th Street, The Park West Village Tenants’ Association held a Community Meeting on the toxic levels of lead that exist in the parking lot proposed for development next to P.S. 163. Our petition calling for the environmental assessment was signed by attendees last night. You can add your voice to the demand for action to protect all of us against lead toxicity by signing the petition online. Click here. This parking lot has been found by health experts to contain toxic levels of lead that if disturbed by construction and made airborne would be toxic to young children, pregnant women, seniors, people with respiratory problems and others. More than 200 people – including Council Member Melissa Mark-Viverito, Chair Community Board 7 Mark Diller, District Leaders Joan Paylo and Nick Prigo, Celine Mizrahi representing Congressman Jerrold Nadler and Rebecca Godlewicz representing Manhattan Borough President Scott M. Stringer – joined in a conversation to demand Gov. Cuomo to require the State Health Department and the State Department of Environmental Conservation to perform an environmental impact assessment as required by the State Environmental Quality Review regulations (SEQR) before ANY ground can be broken at the site. Read more about the meeting in this April 26 article on DNAinfo.com. Please sign the petition. The lead levels found are frightening and we must demand the State live up to its responsibility to protect its citizens from environmental hazards. The louder our voice, the better our chance of being heard so please also circulate this information to your contacts, and use your network (via facebook, twitter, etc) to shine a spotlight on this threat to our health! No JHL at PWV! 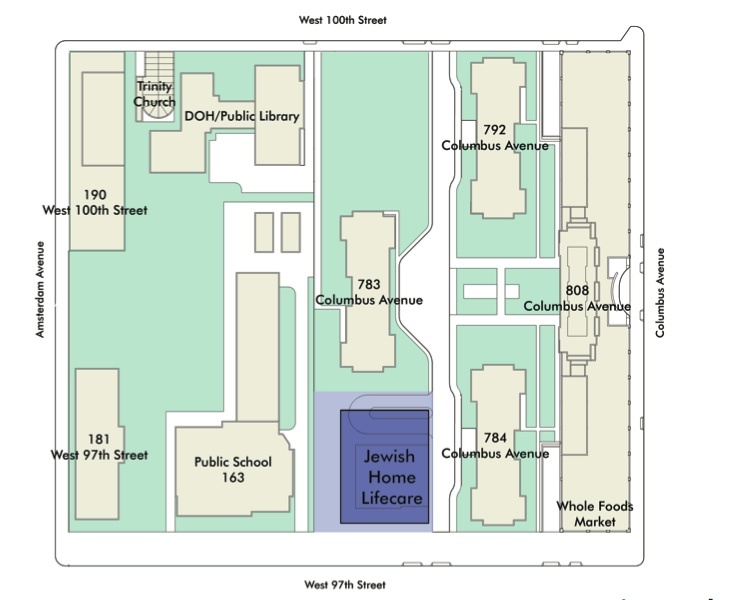 is a coalition of Park West Village community stakeholders, nursing home advocates, parents, tenants' associations, neighbors, renters, and condo owners who oppose Jewish Home Lifecare's inappropriate proposed development on West 97th Street. Jewish Home Lifecare (JHL) plans to trade its more than two-acre footprint on 106th Street for a small, quarter-acre lot on West 97th Street at Park West Village (PWV), squeezing a new high-rise nursing home onto this already highly congested block – with the help of megadeveloper Chetrit Group.